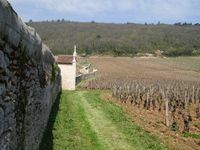 "Readers may recall the change in vinification philosophy occurring here that I have reported on in the last two Côte de Nuits Issues. This is to say that Sylvie Esmonin had been using a small proportion of stems but since 2003, between 30 and 70% is now the norm though the Clos Saint Jacques was 100% in 2005. This decision has clearly had a significant impact on the style of the wines and to my taste, clearly for the better though it remains to be seen how they will unfold with time in bottle. With respect to the 2006 vintage, Esmonin told me that the "winter was long and the spring cool, which lasted until May as there were even a few snow flurries. By contrast, June and July were very hot with a pretty serious hail storm at the end of July though our vineyards were thankfully almost completely spared. And in yet another contrast, August was cool and damp yet September was ideal. About three weeks before the harvest, I had my team comb through the vineyards carefully to eliminate any rot affected or unripe berries. Because I am now using a much higher proportion of stems, I waited an extra three days than I would have otherwise, which is to say that I began picking on September 25th. Maturities were strong and there was almost no chaptalization as sugars ranged from 12.5 to 13%. Yields were moderate at 30 to 35 hl/ha and phenolic ripeness levels were so good that I was able to use fully 80% whole bunches for the Clos St. Jacques. The total cuvaison was on average 15 days, which is only slightly shorter than the 17 days I used in 2005." As I have noted before, save for the Volnay "Santenots" the quality here has become very consistent and both the 2006s and 2005s are excellent in the context of their respective vintages. In particular, don’t miss the 2005 old vines Gevrey as it delivers superb quality at an affordable price. As to the Santenots, I’m not sure what is going on with it because for the third vintage in a row, Esmonin has declined to present it, attributing her decision to heavy reduction. "